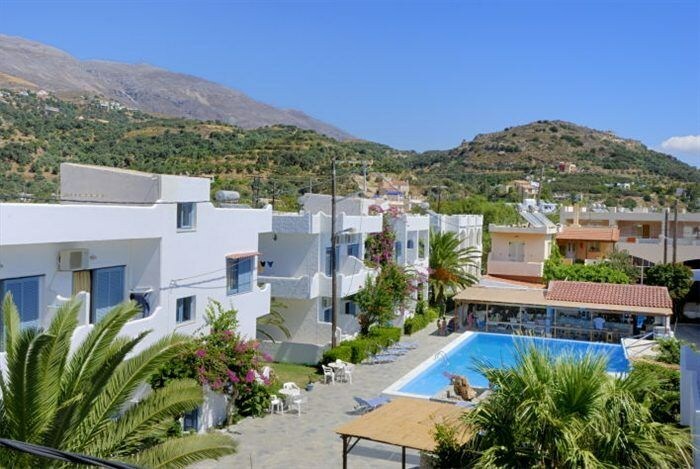 General Description: Apollo Apts Plakias in Plakias has 36 rooms, spread over 2 floors. The hotel is located 100 m from the pebble stone and sandy beach. The closest city to the hotel is Rethymno (25 km). Other cities: Heraklion (75 km). To make your stay more comfortable a reception, air conditioning and a lobby are available. The staff in this 2 storey hotel speaks English and German. The hotel features a fresh water swimming pool. Guests can unwind with a drink at the poolside bar. Sunshades and sunbeds are available free of charge at the pool. Distance from the hotel to: airport HER (75 km). The hotel is within easy reach of tourist information, bars and restaurants and city centre. Vehicles may be parked in the parking lot. Amenities: For convenience the following services are offered: a safe. Reception hours: 08:00 - 23:59. Meals: The breakfast type is Buffet and it is provided from 08:00 - 10:00. The hotel has one restaurant.